Join the Department of Aerospace Engineering on March 9, 2011 for "Creating Sustainable Value Through Innovation" with Steve Weiner,Director of engineering sciences and Kevin Bredenbeck, Director of test & evaluation and chief test pilot for the X2 Technology Demonstrator program at Sikorsky Aircraft Corporation. Weiner and Bredenbeck will discuss how innovation led Sikorsky to develop a program that will help helicopters reach record-breaking speeds. The talk will take place in Resnik Lecture Hall of the Glenn L. Martin Engineering Building in room 1202. Steve Weiner joined Sikorsky in 1978 as a Flight Test engineer on the S-76 certification program. After joining Sikorsky’s Aerodynamics group in 1980, he was responsible for the aerodynamic performance of the S-75 ACAP. In 1981 he was assigned to the New Product Development group as the resident aerodynamics engineer, where he was part of the team that developed the LHX. Weiner was the System Engineer for the S-76 Fantail Demonstrator development team, which was instrumental in helping Sikorsky win the RAH-66 program. Weiner supported the RAH-66 Comanche program for 19 years, initially as Aerodynamicist and later as Technology Manager. In 2001, he was asked to form the Chief System Engineer’s group. In 2003, Weiner helped form and lead the New Concepts group in the development of the X2 Technology Demonstrator and related concepts. 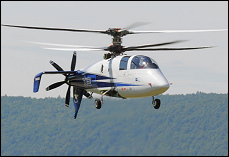 Weiner has been a primary proponent of X2 Technology as a key to expanding Sikorsky’s technological leadership in the rotorcraft industry and as a means to develop new engineering talent. He has been the technical lead of the program since its inception. In 2005, Weiner was also appointed Director of Engineering Sciences, with responsibility for the primary aeromechanics, mass properties and observables attributes of Sikorsky’s current and future products. Kevin L. Bredenbeck is Director of Flight Operations and Chief Test Pilot for Sikorsky Aircraft. Kevin is responsible for the global oversight and operations of the Sikorsky Flight Office, and Flight Operations. Kevin’s charter is to provide the leadership and oversight ensuring that Sikorsky continues its outstanding flight test development safety record across global operations, including definition and implementation of processes and procedures that guarantee that success. Since joining Sikorsky Aircraft in May of 1994, Kevin has performed in a variety of assignments from Test Pilot to Director Test & Evaluation and been instrumental in developing new technologies for the various production models and the test flying on numerous growth and development programs. At present he stays busy with the test teams responsible for the six ongoing development programs at Sikorsky. The FBW H-92, the FBW U.S. Army UH-60MU Black Hawk, the S76D, the FBW U.S. Marine Corp CH-53K Super Stallion and the FBW X2 high speed demonstrator helicopter in which he has been involved with since its inception back in 2004. The Sikorsky X2 is a single engine coaxial helicopter with a pusher propeller. The project was funded exclusively by Sikorsky Aircraft Corporation and completed from concept to completion of all goals between 2005 and 2010. The bulk of flight test was executed in 2010 to include unofficially breaking the helicopter level flight speed record by over 15% (was 217 KTAS, X2-251 KTAS). The rotor is extremely stiff with the preponderance of lift produced on the advancing half of the rotor disks to eliminate retreating blade stall as a limitation to, legacy helicopter, forward speed boundaries. This presentation will discuss the flight test effort and process employed to safely achieve all the program goals on this unique air vehicle without any wind tunnel data. Flight test discoveries included understanding air flow of the rotor over the vertical and horizontal tails, rotor pitching moments, rotor phasing, aircraft vibratory environment, and basic aircraft stability including stability system optimization. The Sikorsky X2 is a single engine coaxial helicopter with a pusher propeller. The project was funded exclusively by Sikorsky Aircraft Corporation and completed from concept to completion of all goals between 2005 and 2010. The bulk of flight test was executed in 2010 to include unofficially breaking the helicopter level flight speed record by over 15% (was 217 KTAS, X2-251 KTAS). The rotor is extremely stiff with the preponderance of lift produced on the advancing half of the rotor disks to eliminate retreating blade stall as a limitation to,legacy helicopter, forward speed boundaries. This presentation will discuss the flight test effort and process employed to safely achieve all the program goals on this unique air vehicle without any wind tunnel data. Flight test discoveries included understanding air flow of the rotor over the vertical and horizontal tails, rotor pitching moments,rotor phasing, aircraft vibratory environment, and basic aircraft stability including stability system optimization. Visit the Department of Aerospace Engineering calendar for additional information on this event.